Kitchens and Bath Remodeling are normally considered as very similar projects! Both have cabinets, sinks, and countertops, normally with tile floors, making this type of work very similar in our industry! You may not think of them being similar, but without the appliances, toilet and tub or shower, they are very much the same! See our gallery for photos of kitchens and baths that have been remodeled, or bring your photos to us for us to make that magazine look in your home! Our designers can design your kitchen, and using our factory direct cabinet pricing guarantees you a beautiful kitchen and at reasonable pricing! 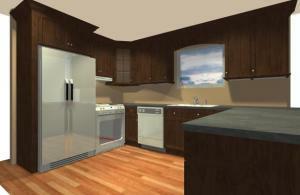 Drawing design at left, Nearly completed kitchen at right! New factory cabinets, stained inside and out with a finish only the factory can apply, with hidden hinges, full overlay doors, glass door at corner cabinet, new appliances, and of course new granite counter tops! The newly re-finished wood floors completes this kitchen, only missing their coffee maker! See more kitchens, baths, and other interior remodeling projects in our gallery, and Call All Pro Improvements today at 803-798-4486 for your free estimate! What is the difference? 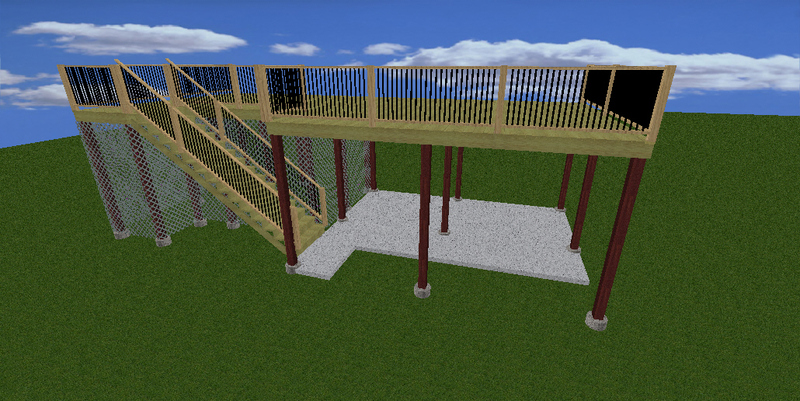 Basically the Porch has a roof covering the “Patio” which could be a “deck” instead! A Patio is normally closer to the ground level and masonry type construction also. You don’t have to be a designer, to know what you want in a patio or a porch. Instead you should know “How you plan to USE the patio or porch” and then the design will come into play! Since 1997, we have asked customers how they plan to use their new patio or porch, and the answers were mostly, entertaining, sitting outside, large family gatherings, and watching the kids play. Some were also considering where the pets could go during bad weather, and still others wanted an outdoor space for smoking, or storm watching! Mostly though, the answer was explaining why they wanted more living area, extended to the outdoors. Our customers seemed somewhat shocked in our asking “How do you plan to use your Patio or Porch?” but the answer helped dramatically to design their space! Basically a 10’X10’ area is needed for a 4-chair dinette or table, for example. Where this furniture can sit in smaller areas, as small as 8’X8’, this would cause for someone to have to get up, when another person wanted to get a drink, for example. The “Path” is also to be considered. What’s the path? The path is the walking area from the entry to the porch from ground level to the entry door to the home! This will be the highest traffic area of the entire space, be it a patio or porch, from where entered from the home, and exited to the yard. This alone can help you to best locate your steps to the ground level! Getting an idea of the furniture planned to go onto the porch or patio drastically helps to design the space more properly, as you can see. Other needs may be a pet door, and that location might change the furniture layout. Another consideration is the grilling space. Once the above is discussed, and possibly more, the size is then determined, hopefully within your budget. Now let’s discuss types, patios versus decks, and then Porches. Patios are normally at or near to ground level. Some are raised, but most all are masonry with a combination of brick or block, with a concrete surface or floor, which may be stamped concrete, brush finished concrete, pavers, or tiled as desired. Designs such as your initial, or nautical designs may be inset within the above mentioned for custom looks also! Do you want a Gamecock at your new patio floor? Patios normally do not require permits and can actually be placed closer to property lines. This is considered as if a “Hardscape” item of Landscaping by many permitting authorities. 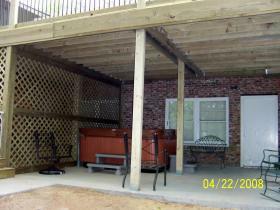 An improperly designed patio could be determined as a fence, due to the slope of property, and may require a permit. 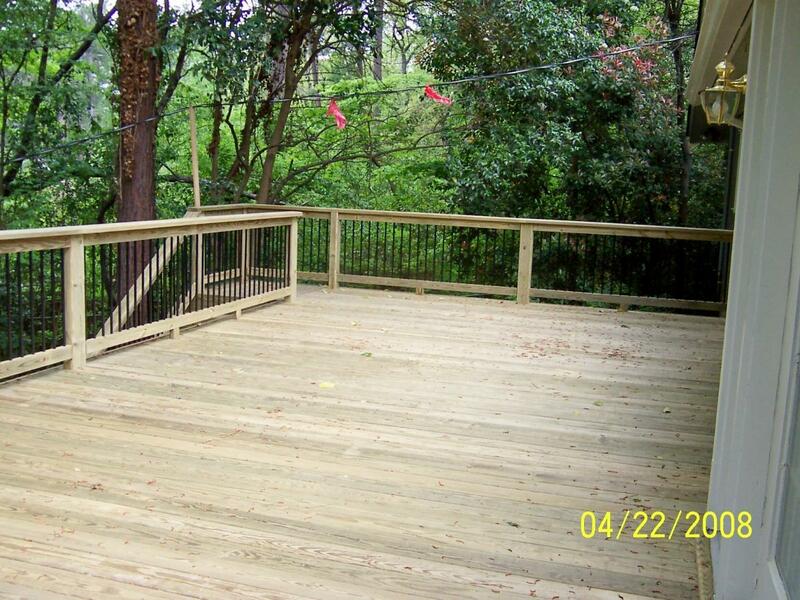 Decks are normally used in the place of a patio, as these can be higher off of the ground level, for less expense. 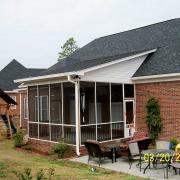 Most porches are simply a roof built upon the patio or deck, without walls. A Pergola can be used instead of a roof to complete a new porch also! All of these would require a building permit! Some customers get porches now, planning for a future sunroom, or other type of room, allowing the use of the space today, with plans for an enclosure for later! Some get patios or decks now, again so they can use the space, until they later want the roof & walls built for a room, be it a sunroom or a bedroom for a child expected to outgrow their existing bedroom arrangement! Even if there is no plan to “enclose” this space in the future, the foundation should be built to allow that ability, just in case! 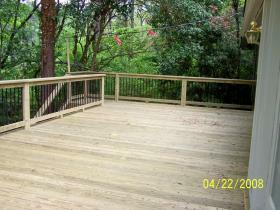 Lexington County was once requiring a deck to be constructed as a buildable space, since so many people were enclosing their older decks anyway! So, we have briefly discussed size, and various designs and the differences of those designs. Now let’s talk about the materials. So we now have brick as a main component of the patio. If you don’t have a brick wall base at your home, then a simple concrete, or stamped concrete look would possibly be matched to your home. The patio surface can be almost anything, but again is normally masonry! Concrete with a brushed finish is very popular. 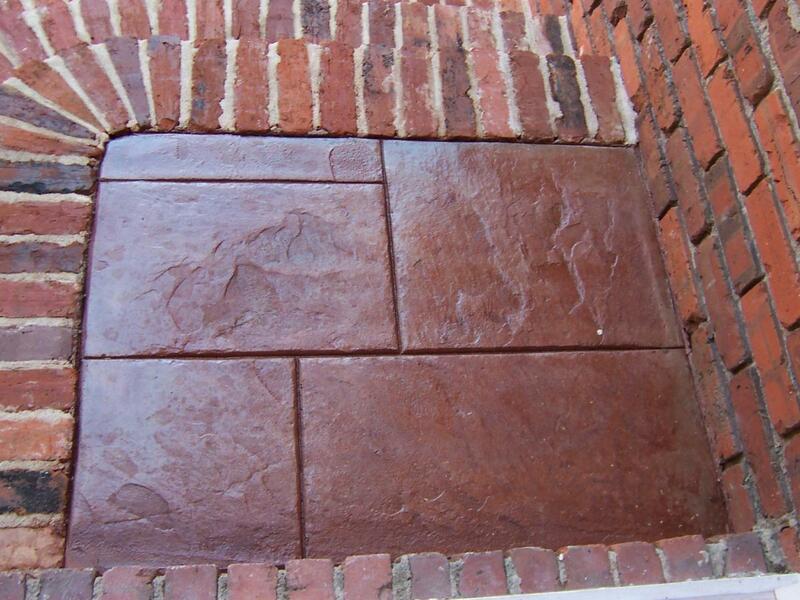 Terracotta Tiles, broken or not, was a highly used patio and porch surface in previous years. Pavers can also be used, built on a sand base. Today however the finishes are concrete (cement) with a brushed finish, for reducing slipping. 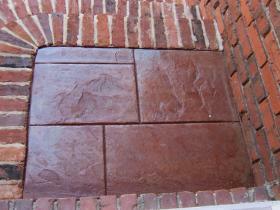 Other items are ceramic tile, stamped concrete, stained or acid washed concrete. 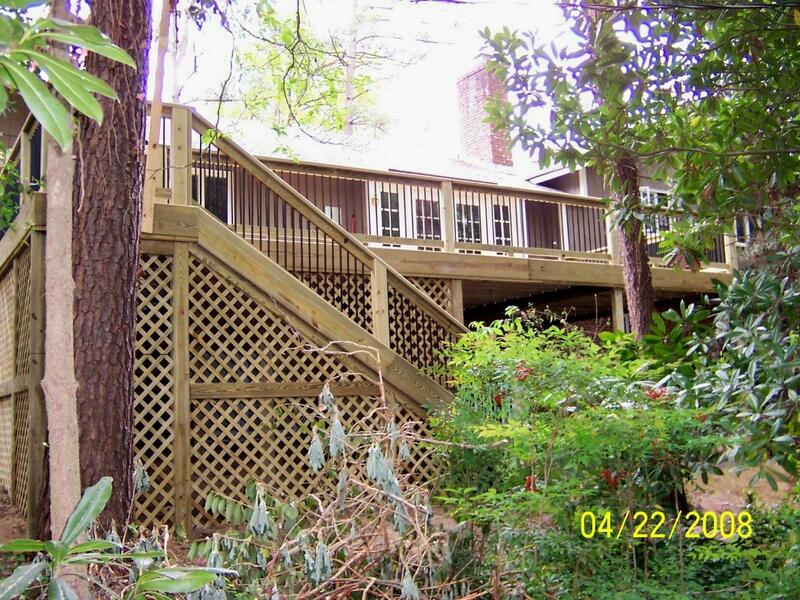 There is one more, which is rare, and that is to have a deck floor, with the masonry foundation. At left is a brush finished concrete patio, and a brick surround newly built screen room again with the brushed concrete floor. Walls were framed with traditional treated lumber, also using a traditionally framed new shed roof and siding, all to match to the home's original construction! Decks and Porches are normally built of wood, with the occasional brick foundation or surround. 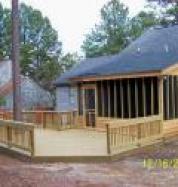 The surfaces of the deck for the porch can be wood or masonry. When building a deck type of structure, knowing in advance what is necessary to meet the future dreams and demands, be it from entertaining, sitting, sunbathing, etc., can make the difference on construction methods used. A hot tub for example would require additional supports of course, but also knowing how many people may be coming for entertaining purposes can also cause the construction to be “upgraded”. We don’t know why other companies would build a deck type structure, without building it as strong as it possibly can be, as long as it is feasible, but they do. A deck designed to hold 20 people could fail if 30 people were to be entertaining there! Our company has installed many porches to existing decks, and most of the pre-existing decks required modifications to allow for the planned activities, as well as the planned roof structure and/or wall weight being added! These modifications could have been done in the original design for a little more money and effort! If you look closely, there is a screen door to her new porch also. So this customer got a new screened porch and a new deck, and now there is plenty of room for her and her grandchildren when they come to visit. She can sit inside the screened room, while the grandchild plays on the deck, or in the back yard! Just what SHE wanted! 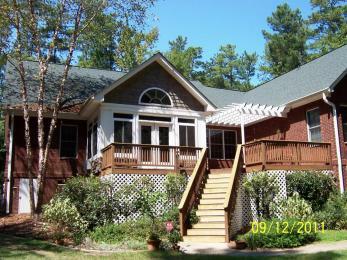 She can also entertain in the main home, with a door to the porch, then another door out onto the deck! She is now ready for a lot of people visiting, or for just her and her grandchildren! A porch can be at the front or the rear of the home. This new Front Porch makes for a grand entrance, compared to the original steps and landing that was there! Two rockers and a table is all that this homeowner wanted at her front porch. The brick surround foundation was not used here, because she wanted to save the money, but also because of the steps planned, water from the roof and yard could have become “backed up” there near the front steps, and possibly gone into under the home! 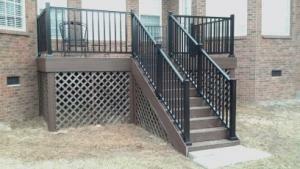 Drainage aspects are a concern when designing your porch or patio also! You really don’t want to attach anything to your home, that “looks manufactured", do you? There are many different “KIT” type constructed porch covers that just don’t match to the home, and could take away from the value of a home or neighborhood, when considering curb appeal. Move your mouse over to see just WHAT IS NEW on this home! So Patios and Porches come in so many different looks, and types, that only YOUR imagination can make the difference, as well as how you plan to use your new outdoor area! A patio with a large fireplace would be very nice also! Outdoor kitchens, located on the new patio or deck, or a simple fire pit can take an otherwise dark cool evening, and turn it into a magical night outdoors! The wrought iron handrails combined makes a huge difference in the entrance to this home! Decide now just how you plan to USE your new space! Because one day you may want your porch to become a new room! You want more home value! You want to be proud of your home, for years to come! home square footage! We match the new stacked stone to her existing fireplace in the family room! Stacked stone knee walls, Sliding windows with Transoms above, with a separate heatpump. See the new Pergola also, which offers partial shade. This is known as an “Enclosure” of an existing space, which was the former screen room below! This room and porch dramatically improves the home, it's appearance and value, while also allowing the homeowner's to get all that they wanted for their home! For more on Outdoor Spaces, see Decks and Patios! Additions to your home can include Master Suites, Dining rooms, Kitchen or bath extensions, Sunrooms, Screen Rooms, or even enclosing of an existing carport or garage can add the extra living area your home needs and wants, but maybe you are wanting more? More windows make for more light, even during the winter! Using the right windows, we offer very energy efficient windows, which can match in design to your existing windows, including color matching if needed! Whether you want an In-Law suite, or a new family room, dining room to change the "Great Room" setup, or a new Master Suite with a master bath, granite, marble, cultured marble, body sprays, shower, spa tub, fancy or simple, All Pro Improvements can help you to have your dreams come true! After all "An Addition should NOT look like an Addition!" Built to match your home's exterior, the interior can be as modern as you wish, or matched to the interior of your home as it is! Consider the possibilities by viewing our Gallery, and ask about our design and build services! Ground up construction to "Dry In Status"
Roofing, Gutters, Shutters, Replacement Windows, Siding, insulation upgrades, flooring, as well as interior remodeling! A clean job from start to finish! Financing through FHA Hud title 1 - No Appraisal - Federally backed loans. Whatever you want, that is a responsible building design, we can do for you. We can do as little, or as much as you want done, to help your project to come in at your budget demands. Some projects may even be done in stages, again as the budget allows! Explore our website, and contact us for YOUR Free Estimate! Learn more about our Design/Build services that may save you thousands! Remodeling interior or exterior is taking the existing structure, and modifying it to what you want. 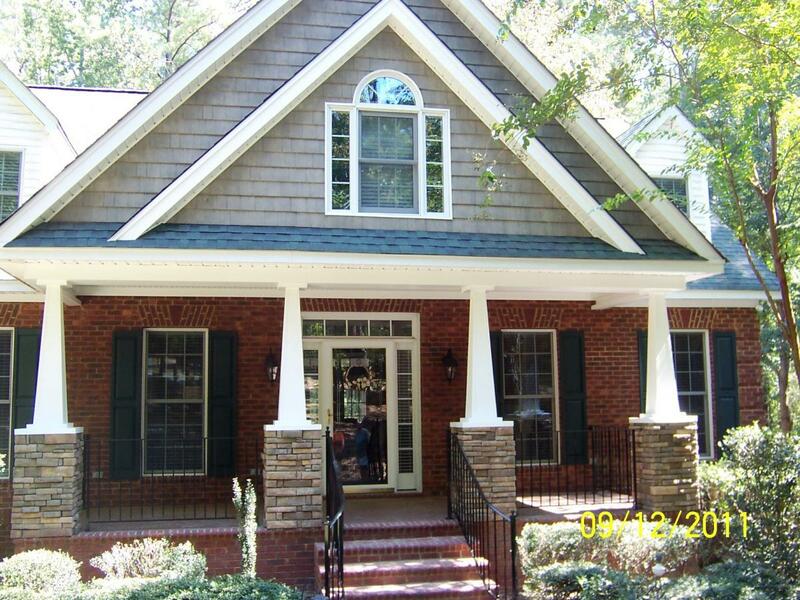 Exterior remodeling can include new siding, roofing, decking, and more. Our installers can make this type of work look easy! A true professional can make any job look easy, but keeping a clean work area and meeting certain time lines takes even more professionalism. Remodelers, specializing in remodeling, are a special breed of contractor! Most contractors know how to build a new home, or subdivision, using today's building codes and typical construction methods. A Remodeler, or remodeling contractor, has to be knowledgeable with today's building codes, as well as past building codes and/or building practices, to be able to adapt the existing structure to the building codes of today, without running the price up to out of this world! During the recessionary periods of recent, and in the past, new construction type builders have attempted to enter into the remodeling market, and quickly exited, and vowed never to return! Want a wall removed, we can do that! Now let's also fix the ceiling, and fix the floor covering that is not under that removed wall, and if it was, it isn't the same color now! This is what we do, and we like doing it! We take your home, and modify it to your desire, and we will be priced on target for the work required. Fair and up-front pricing is important to our company's success, and to your budget! We don't want to get to the end of the project, and then you learn you went over budget! Changes are a part of this business of updating older homes and bringing them into this century, but even with those changes, we can prepare you in advance, so that you have a really good idea of the ending investment! Remodeling is an investment in many ways! Not only will you enjoy the "new" home or parts of that home, but your home will be realized from appraisals to insurance coverage aspects, to be a newer home! 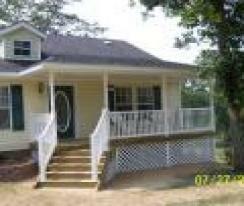 A home built in 1949, remodeled properly, can be insured as if it were a 15 year old home! Unless you change the overall "footprint" of your home, your tax basis may not change! Now let's meet, and get to talking about what modifications you want to make, determine a budget, and then, if you are willing to go forward, we can put together a proposal for your project. During this first meeting we will guide you to let you know when you are "about to open a can of worms" and dramatically increase the overall costs. For more information on "How do we satisfy our customers" simply click on the link, to learn how our step by step, from first meeting expectations to proposal goes. Call All Pro Improvements today at 803-798-4486, or click on the "Contact us" and send us an email, but anticipate a rapid response also. 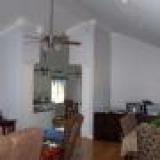 We offer moving of walls, ceilings, bathrooms, kitchens, whether relocating those areas, or simply enlarging those areas. We also offer additions for adding on to your existing home, which might be better for your overall budget, than some plans we have investigated in the past! A client wanted a master suite, with the huge garden tub, walk in closet, and of course that large oversized bedroom she wanted. When she realized that she wanted would be a "wing" added, and at some $85,000, we were able to guide her to enclose her rarely used carport, get most of the options she wanted, and a new laundry room, for only $31,000. She was happy for years with her new master bedroom suite, since she wasn't using the carport anyway! She was able to unload some storage items as well.